Dorchester is an unincorporated community in northwestern Allamakee County, Iowa, United States. It lies along local roads just off Iowa Highway 76, north of the city of Waukon, the county seat of Allamakee County. Its elevation is 738 feet (225 m). The town was originally settled by Harvey Bell and Edmund Bell, and was named after Dorchester, England. Although Dorchester is unincorporated, it has a post office, with the ZIP code of 52140, which opened on 21 May 1857. Dorchester is located in the Waterloo Township. Dorchester was platted in 1873. Dorchester's location in the flood plain of the Upper Iowa River makes it vulnerable to flooding; the community was damaged by high waters in August 2007. It was worse hit on 8 June 2008 and succeeding days: over seven inches (over 18 cm) of rain fell on the 8th, and resulting record high floods of 22½ feet (20½ m) almost destroyed a trailer park that was a significant part of the tiny community. A LP gas tank from Dorchester was discovered just eight hours later in Lansing, on the opposite side of the county. All students in the area are enrolled in the Allamakee Community School District in Waukon, even though Dorchester is closer to Spring Grove, Minnesota. ^ Savage, Tom (2007). A Dictionary of Iowa Place-Names. University of Iowa Press. ^ Hancock, Ellery M. (1913). Past and Present of Allamakee County, Iowa: A Record of Settlement, Organization, Progress and Achievement, Volume 1. S. J. Clarke publishing Company. p. 307. ^ Alexander, W. E. (1882). History of Winneshiek and Allamakee Counties, Iowa. Western Publishing Company. p. 401. ^ Entire Neighborhood Destroyed, KAAL, 2008-06-10. Accessed 2008-06-14. ^ NE Iowa town inundated by Upper Iowa River flood waters, La Crosse Tribune, 2008-06-10. Accessed 2008-06-14. ^ Dorchester residents work to recover from last weekend's flash flooding Archived June 8, 2011, at the Wayback Machine, Waukon Standard, 2008-06-20. Accessed 2008-06-20. 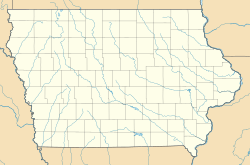 This article about the geography of Allamakee County, Iowa is a stub. You can help Wikipedia by expanding it. This page was last edited on 29 April 2018, at 17:51 (UTC).